It's finally spring, the time of year when the flowers bloom, the sun is out for longer and birds are nesting. But nesting is not being made easy in many parts of England, with increased reports of developers covering hedges and trees with netting. The Royal Society for the Protection of Birds (RSPB) says developers do this to make it easier for them to remove greenery when the time comes, as although it's an offence to destroy an active nest, there are no laws to prevent the installation of nets to stop birds nesting in the first place. One of several high-profile figures to condemn the practice is naturalist and broadcaster Chris Packham, who has described it as "ghastly" and the "antithesis of everything conservation stands for". The RSPB - which says the UK has lost more than 40 million birds in the past 50 years - has now asked the government to address this issue. Nottinghamshire Wildlife Trust says netting "seems to be an increasingly common practice", which it's seeing "more and more on developments", while the Woodland Trust believes it's been happening for a few years. The representative body of the homebuilding industry, the Home Builders Federation (HBF), says installing this type of netting is not a new thing but as it's not aware of anyone who monitors its use, the organisation can't comment on whether the practice is on the rise. Netting is being spotted all over England, often in places where preparation work is being carried out for planned housing developments. In Guildford, 11 trees have been covered by Sladen Estates, which is aiming to build 191 homes on a derelict site, and netting has appeared on hedgerows in Stratford-upon-Avon, where Taylor Wimpey intends to build a 270-home development. In Tuffley, Gloucester, blue and green netting has been installed, while in Darlington, a dead sparrow was found on land where homes are set to be built, caught up in black netting. Darlington Green Party says residents are tying green ribbons to hedges and trees in protest. Some netting has come down, however. Tesco removed nets installed at a store in Norwich after criticism from bird-lovers on social media. Yes, although the RSPB says there are legal responsibilities such as fitting the netting properly and checking it regularly to make sure birds and animals aren't trapped. Image caption Broadcaster and naturalist Chris Packham says this "ghastly new netting practice has to stop"
The great and the good have criticised the practice, including author Philip Pullman, who described the Guildford tree covering as "wicked", and TV presenter Jake Humphrey, who called the Tesco netting in Norwich "nonsense". A petition calling for netting hedgerows to become a criminal offence has more than 36,000 signatures and a campaign has been started asking people to send photographs of netting to their local authority, including the #NestingNotNets hashtag, with details about the location. Dr Rob Lambert, an environmental academic from the University of Nottingham and vice principal of Nottinghamshire Wildlife Trust, says the reaction of the public "expresses the real connection we have with nature". Dr Lambert, who says 25 million people across the country regularly feed birds in their gardens, believes the netting issue has struck a chord. "There is an incredible sense of 'what have we become and why are we doing this?'" he says. "I can absolutely see the pressure housing developers are under but we have to find a way forward where nature does not come last." William Davis Homes, which has covered hedges in netting in Radcliffe-on-Trent in Nottinghamshire, says it was given permission to access the site in November. A spokeswoman said: "The works are being carried out in compliance with planning consent, observing the requirements of Countryside and Wildlife Act and following industry best practice." 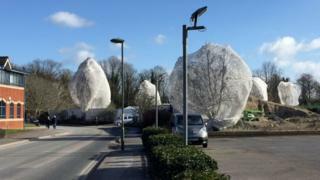 Developer Sladen Estates, which aims to build 191 homes in Guildford, says it took advice on the use of the netting. Andrew Whitaker, from the Home Builders Federation, says: "Netting trees aligns with the relevant environmental requirements in instances where it has been agreed with the local authority that a tree has to be replaced." He adds: "Last year, house builders planted about nine million trees and shrubs, making the industry one of the nation's biggest providers of new trees. "As we build the homes the country needs, the industry is committed to bio-diversity, proactively acting to protect birds and providing a net increase in the number of trees." How have wildlife charities reacted? Jack Taylor, from the Woodland Trust, believes putting up netting shows "an alarming disregard for the welfare of wildlife". "While not an illegal practice, we consider that netting hedges and trees during the nesting and breeding season is inappropriate," he says. An RSPB spokesman says we "cannot keep trying to squeeze nature into smaller and smaller spaces or demanding it fits in with our plans". "We are looking to the government to not just ask planners and developers to think about whether it is necessary to remove the trees and hedgerows that are vital for supporting our wildlife, but to ensure that developers replace what they take away." A spokesman for the Department for Environment, Food & Rural Affairs (Defra) says it wants developments to "enhance our natural environment" and has announced plans to require developers to deliver a "biodiversity net gain". The Defra-sponsored body Natural England says it doesn't regulate the use of netting on trees, but that it's "essential that developers look at the most suitable option for complying with the necessary regulations". It says alternatives to netting, such as scaring off birds or restricting access to food sources, can be useful management tools to guide animals away from particular areas.